Author Rachel Hollis ("Girl, Wash Your Face"); soap-opera stars Scott and Melissa Reeves. Muggy with areas of fog. Lows near 70. Heat and humidity stick as strong southwest flow dominants hot weather through the start of the weekend. Today will feature continued hot and humid conditions with heat indexes flirting with 95 degrees as dew points climb into the low 70s. Highs today reach near 90 degrees across the south and the mid 80s across the north. Showers and an isolated thunderstorms may develop south of the Mass Pike with such a humid air mass in place. A warm and muggy night is in store for tonight with low temperatures dropping into the upper 60s to near 70 degrees. Expecting a dry night with fog developing in typically-prone areas. Yet another hot day is on tap across New England Thursday as mostly sunny skies prevail. Humidity levels will drop slightly but, still expecting heat index values in the low 90s. Mostly dry weather is expected but, a stray shower or t’storm cannot be ruled out given tropical air mass. Sea breezes will criss-cross the region Thursday as weak land-sea boundary develops. Highs reach into upper 80s to near 90 degrees. 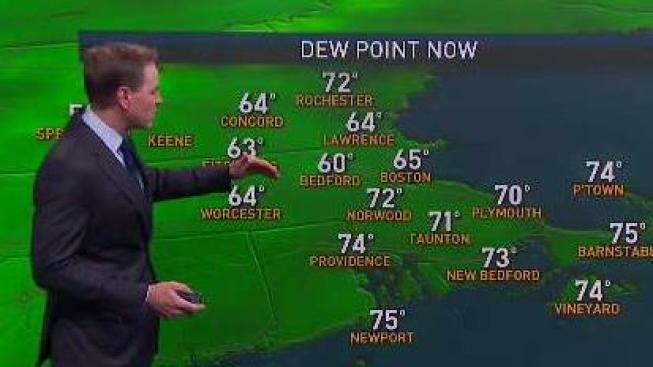 West winds bring lower dew points and more comfortable air into New England on Friday. Highs again will reach into the upper 80s with a few locations flirting with 90 degrees. Areas across the North Country will reach into the mid 80s. An afternoon shower may pop up. Looking ahead to the weekend, a classic west-to-east flow settles in across New England with several waves of low pressure passing overhead. This will result in showers and scattered thunderstorms on both Saturday and Sunday. Not expecting a wash-out by any means though. Highs on Saturday crest into the mid 80s before a cold front pushes through the area. On Sunday the cold front will stall south of southern New England with highs dropping back into the upper 70s south and low 70s north. The stalled front then comes back north as warm front on Sunday night as an area of low pressure approaches from the Great Lakes.